Soak Sorghum millet for 12 hours minimum. Drain water and transfer the millet to a pressure cooker. Pour 3 1/2 cups of water in it. Add few drops of oil, a pinch of turmeric powder and 1/4 teaspoon of red chilly powder. Cover the lid and cook for 15 minutes. After the first whistle, keep the flame in medium heat. If the millet is fully cooked, keep it aside. Dry roast Greengram lentil till it becomes golden brown. Cook it separately and keep it aside. It should be soft enough and not too mushy. In another pan, heat oil and add items listed under ‘To temper’ one by one. Add chopped onion and sauté for few minutes. Add all the chopped vegetables and sauté well for few minutes. Add the remaining 1/4 teaspoon of red chilly powder and mix well with the vegetables. Cover the pan with a lid and cook for few minutes. If required, sprinkle some water so that the vegetables can cook faster. Turn-off the flame when it is done. 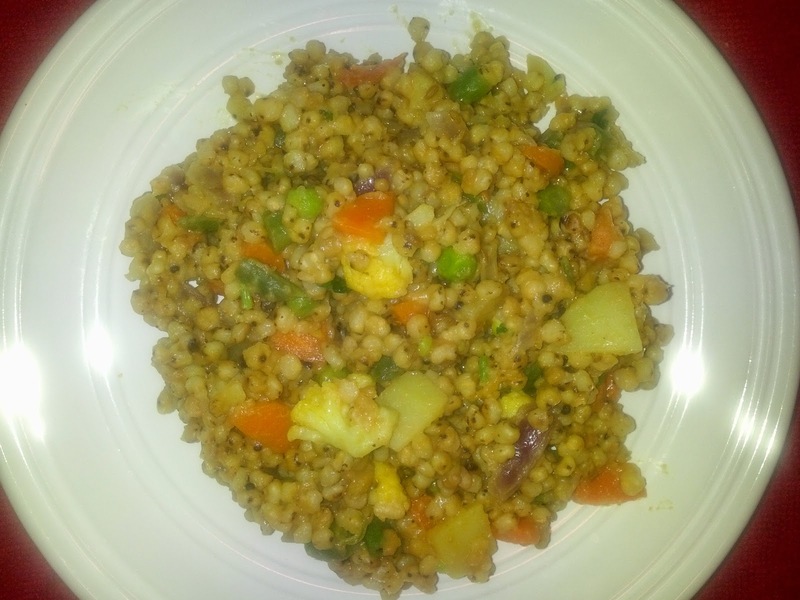 Mix cooked Greengram lentil and vegetables along with Sorghum millet. Add salt as per taste. If the consistency is good, transfer it to serving bowl. If it is slightly watery, cover the cooker with lid and keep it in low flame for atleast 3 minutes. Finally garnish with chopped cilantro leaves and serve. I always wanted to try some recipes using whole Sorghum & Pearl millets. Because, we get more nutrients while eating millets in full form rather than flour form. But I was worried about time it might take for cooking. I referred few Kichadi recipes online which cleared my doubt on cooking time. This recipe is a blend of two recipes, I have come across. Soaking the millet for a very long time (i.e. 12 - 16 hours) will reduce the cooking time. If possible, sprout the millet and then cook. You can add few pieces of tomato along with other vegetables while sauting. Just like all other millet recipe, eat it when it is hot/ warm. It will become slightly harder if it becomes cold.